Shuffle (leit-naul .«.uo ™>vu. 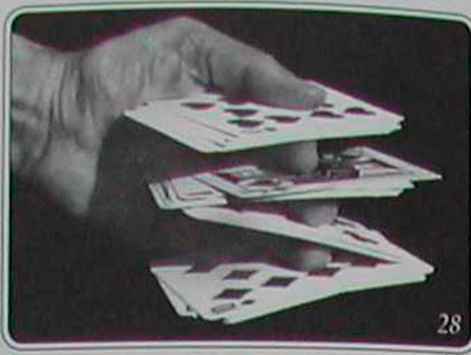 ..ym-iirtiui cards face up) Execute the f ^ m° p0sition iora faro ¡from the left-hand half) is on top and a reversed card (from the riaht h-m,i Lin ° S° L iv facc*down card o physically move one or two cards around after the shuffle to r" ^TT Y°U ^ ^ no idea what you're doing so it doesn't matter. (The shuffle, incident^! SToi S^SS^E deck. Cut the deck and ribbon spread it widely on the table so every card can be seen. The audience will see , hodgepodge. You. on the other hand, will instantly see the Jack of Diamonds just left of center (fig 4) That illustration also shows the locations of the four chosen cards. The first selection is the second face-down card to the left of the Jack ot Diamonds. The third selection is the fourth face-down card to the left of the jack. The second selection is the first face-up card to the right of the Jack, and the fourth is the third face-up card to the right of the Jack. Say. to the first spectator. "Do you see your card?" Let him look for a moment, in vain. Say. "Let me take a guess, it's just blind chance that I can find it." Put your finger on the second face-down card to the left of the Jack and slide it out of the spread until it's in front of the first spectator. Square the deck, turn it over, and repeat with the second spectator. When he says that he does not see his card, put your finger on the second face-down to the left of the Queen of Clubs and push it toward him. Square the deck, turn it over, and repeat with the third spectator. After he looks, put your finger on the third face-down card to the left of the Jack of Diamonds and push it toward him. Square the deck, turn it over, and repeat with the fourth spectator. After he has glanced over the deck, put your finger on the third face-down card to the left of the Queen of Clubs and push it toward him. That's it. Ask each spectator to name his card aloud, one at a time, and tell them to turn over the cards on the table. At your leisure, gather up the cards and turn them all the same way so you can continue.